Trump supporters and even those on the left who peacefully disagree with the President are sick and tired of the violence from Antifa, Antifaschistische Aktion, who keep rioting in streets across America. Micro, along with hundreds of thousands of Americans who signed the petition so far has simply had enough with the Anarcho-Communist terror that Antifa represents. He started the petition with a goal set of 100,000 signatures. Little did he know the petition would spread like wildfire and become one of the most supported movements on the <a href="https://petitions.whitehouse.gov/petition/formally-recognize-antifa-terrorist-organization-0">White House Petitions website</a> in such a short period of time. Micro also offered proof that he began the petition and in spite of death threats and attempts to dox and harm his life or the lives of his family he says he's not backing down. Specifically, he said if you negotiate with terrorists they will only continue to feel victorious. Trolls have flooded the comments on his tweets, most likely Soros and GOP hired bots to censor the truth and deflate the message, but nonetheless regardless of the Communist left disinformation campaign the petition has tripled its original goal nearly reaching 300,000 signatures. In the petition, Micro connects the dots and compares Antifa to ISIS with the tactics they use to shut down Free Speech in America. The State Department maintains a <a href="https://www.state.gov/j/ct/rls/other/des/123085.htm">list of Foreign Terrorist Organizations</a> (FTOs) that are designated by the secretary of state. There are currently 61, including ISIS, al-Qaida and Boko Haram. 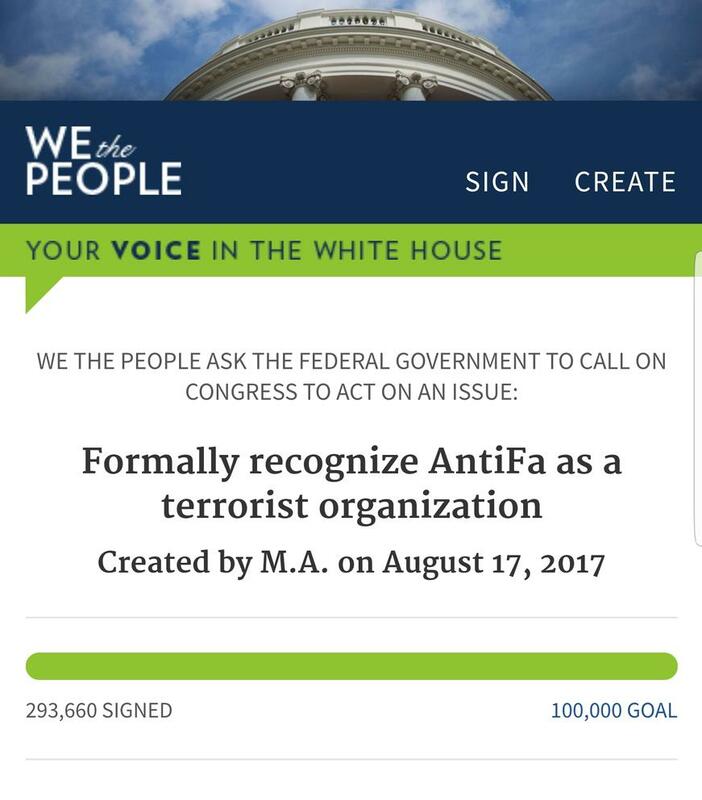 With the growing support for this petition, the American people are keeping their hopes up that the White House formally recognizes Antifa as a terrorist organization. We give a huge thanks to <a href="https://twitter.com/MicroChunkyChip">@MicroChunkyChip</a> for his valiant efforts in starting this petition.